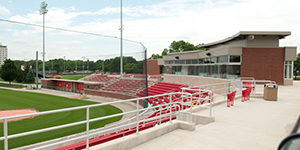 Beautiful, award-winning Duffy Bass Field serves as home to the Illinois State baseball team. It is recognized as one of the top playing surfaces in college baseball through the Honor Award, presented by the Professional Grounds Management Society in 2003 and in 1992. While not winning the award every year, Duffy Bass Field is a perennial contender for the honor. From the lush grass infield and outfield turf to the well-manicured baselines, batters boxes, and pitcher’s mound, Duffy Bass Field benefits from being expertly designed and professionally maintained, as facilities and turf specialists work closely with the coaching staff. After being moved to its present location in 1988, Duffy Bass Field is currently in the northwest corner of the athletics complex and has a seating capacity of 1,500 and dimensions of 330 down the lines, 375 in the power alleys and 400 feet in center. Indoor practice facilities at Horton Field House are close to Redbird locker rooms, athletics training rooms, and coaches offices. Hancock Stadium’s artificial turf is also available in the event of inclement weather. Illinois State Baseball versus Northern Illinois at 5 p.m.